Not too long ago Micro-ATX cases, and the budget motherboards housed within them, were mainly found in offices and schools. Micro-ATX motherboards were considered a low-priced option for making compact, cheap and reliable computers. Back then a micro-ATX motherboard would rarely – if ever – be considered for making a powerful gaming rig. As the Silverstone Fortress FT03 proves, things have changed. Motherboard manufacturers are fully embracing the micro-ATX form to create brilliant gaming motherboards, such as Asus with its Republic of Gamers Rampage III Gene. A powerful micro-ATX motherboard, filled with the latest components overclocked until their pips squeak, won't do well in a standard micro-ATX case, however. As motherboard manufacturers have changed their approach to the small form factor, so have case makers. This is where the Silverstone Fortress FT03 micro-ATX gaming case comes in. While it takes the smaller form motherboard, it's no slouch in terms of size and space. These are essential considerations for powerful PCs that need plenty of airflow and cooling, as well as space for upgrading. As soon as you lay your eyes on the Silverstone Fortress FT03 you realise where it gets its name. This is an impressive monolith that eschews the more over-the-top, and some would say tacky, extravagance of its rivals such as the CoolerMaster HAF 912+ for a more quietly intimidating aesthetic. To access the motherboard, soundcard and graphic card's I/O plate, however, you remove a disappointingly cheap-feeling plastic grille. Having these accessible from above is a novel approach, and certainly makes accessing the I/O ports much easier, as you're not having to root around the back of the case to plug in a monitor. It does mean the cables connecting a PC to external devices tend to overflow from the top of this case, although whether or not this odd look is a problem will be down to personal taste. As far as opening up and installing components inside the Silverstone Fortress FT03 goes, it's thankfully not as impenetrable as its name implies. The left-hand panel slots off without any need for tools, and there is plenty of room to manoeuvre inside the case for installing components. Although it's not as large as Silversone's PS03 chassis, installing the motherboard is perfectly easy. Because it's a smaller case, care has to be taken when arranging cables, especially as you begin to fill the case up with more and more components. Some of the awkwardness you will experience from adding components is more likely to be down to the size of the micro-ATX motherboard, rather than any fault of the case. The Silverstone Fortress FT03's cooling capabilities are also impressive. 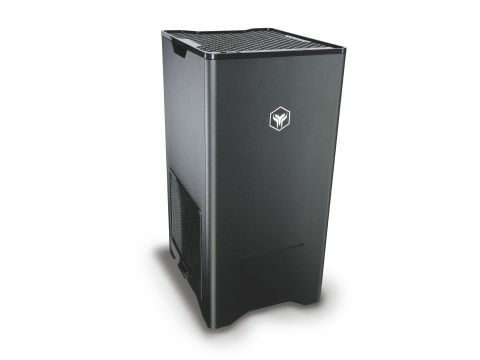 The case comes with two 120mm intake fans located towards the lower half of the case, and angled towards where the graphics card and CPU are to be installed. The PSU is installed at the bottom of the case, where vents expel heat. Its vertical design is not only unusual, but it makes the Silverstone Fortress FT03 a towering presence. It's certainly a love it or hate it design, but there's no denying that it is striking. It's a great case if you are building a powerful PC or gaming rig around a micro-ATX board and a lot of thought has been put into cooling features and installation. With such a striking design, it's a shame that some odd choices have been made to incorporate it. The top access of the I/O ports, for instance, can end up looking out of place. Also, although it is large for a micro-ATX case, it's still not as roomy as chassis designed for full-size motherboards.